This beautifully decorated 5 bedroom, 3 bath beach home has everything to ensure a great vacation for your family and friends. 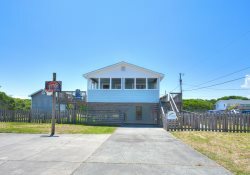 Enjoy direct Ocean Access and a short 4 minute walk to the beach (Approx. 2 Blocks), as well as views of the Wright Brothers National Memorial. Located at MP 7, Seahorse is close to less than 5 minutes away from shopping center, restaurants and Lost Treasure Golfing entertainment attraction. Guests can start a vacation off right with a dip in the private pool, or can head inside to enjoy a little family fun in the recreation room with pool table, wet bar, refrigerator, TV, and easy access to the awaiting pool and adjacent hot tub. There’s also two bedrooms on this level – a Queen Bedroom with TV, and a Double Bedroom with TV – as well as a convenient hall bath. Head upstairs, and enjoy a little peace and quiet in one of three bedrooms that include a King Master Bedroom with TV, a King Bedroom w/ TV, and a Pyramid Bunk Bedroom with TV. There’s also a hall bath nearby as well as two covered decks for effortlessly enjoying the sea breezes. The top level is an oasis for families who want to unwind and reconnect, thanks to a spacious living area with built-in Entertainment Center, TV/DVD, and gas fireplace (Nov 1 to Mar 31). A bright and airy dining area is found nearby, as well as a fully-equipped kitchen. For a nice dose of the OBX atmosphere, step outside to the two sun decks. From the brilliant blue pool and hot tub to the sweet coastal appointments and décor in every room, Seahorse 4 delivers an incredible experience for Outer Banks beach fans. Book your stay today, and discover a serene retreat that’s enticingly close to all the entertainment the OBX is renowned for. Mini-Vacations: Can't get away for a whole week? Please consider one of our "Mini-Vacations." Seahorse 4 gladly accepts stays shorter than a week (three-night minimum stay required). Top-Level: Living area with built in Entertainment Center, TV/DVD, gas fireplace (Nov 1 to Mar 31), Well-Equipped kitchen, dining, and 2 Sun Decks, one with Ocean Views. Bed Linens and towels provided. Mid-Level: King Master Bedroom with TV, King Bedroom w/ TV, Pyramid Bunk Bedroom with TV Hall Bath, Washer/Dryer, 2 Covered Decks.